Leading the national trend of surging applications to most top-tier U.S. universities, UChicago’s acceptance rate is down nearly five percentage points from last year. The admissions acceptance rate to the College has reached a record low, with only 8.8 percent of applicants receiving acceptance letters this year. Leading the national trend of surging applications to most top-tier U.S. universities, UChicago’s acceptance rate is down nearly five percentage points from last year. A record 30,396 students applied to the College this year, marking an increase of more than 5,000 applicants from last year. Dean of the College John Boyer believes that the increase in applications speaks to both the larger national trend and the unique traction of the College itself. The number of admitted applicants from the Chicago area also increased this year. 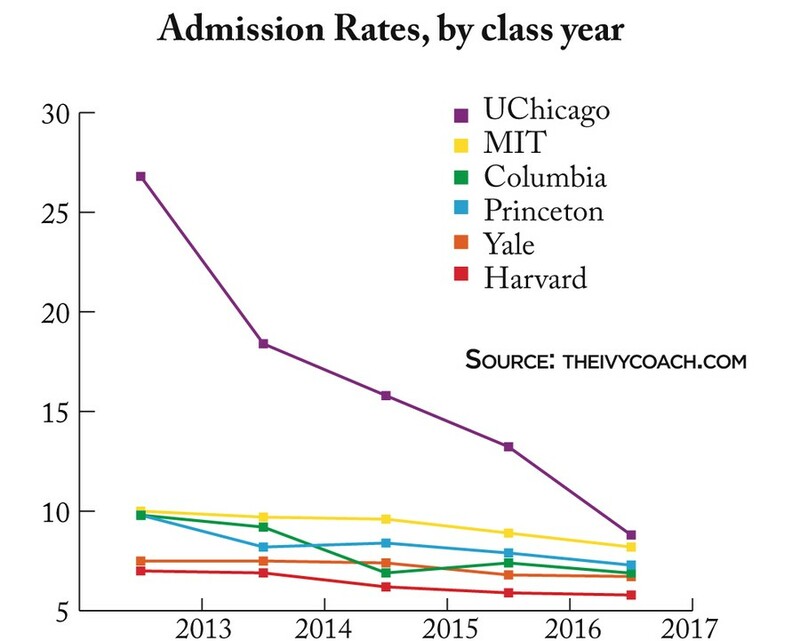 While still comprising only a fraction of the total number of admitted applicants, admitted Chicagoans jumped from 99 students in 2012 to 117 in the most recent round of admissions. Ingrid Yin, a senior from Barrington, a Chicago suburb, was among the local batch of accepted applicants. Yin is in the top five percent of her class at her public high school and received a 35 on her ACT. The launch of UChicago Promise, a multi-platform initiative which aims to assist both affordability and access to college for Chicago high school students, was cited by Boyer as one explanation for the increased number of local applicants. Through the distribution of grants, the program allows for admitted Chicago residents to attend the College loan-free. “We got a lot more applications from students in Chicago, but I think we’ve always been an attractive option for students from parochial and public high schools. The majority of our students came from the city of Chicago up to the 1950s. We were what they called a ‘streetcar school’; most of the students lived at home and came here on street cars or buses,” Boyer said. According to Boyer, the swell in local applicants resonates with a wider commitment of the College to capitalize on its relationship with the city. In addition to an increase in admitted local applicants, the admitted pool is also more geographically diverse than ever. According to a University press statement, the larger national spread includes equal numbers of applicants from the West Coast, Midwest, and East Coast. By contrast, 26 percent of the class of 2016 is from the Midwest, while only 15 percent is from the West Coast. Kelton Anderson, an admitted student from Minnesota, pointed to national rankings in explaining the increase in applications. The University does not disclose breakdown data at this stage in the admissions process, but it reaffirmed its commitment to attracting high-ability students from a diverse range of socioeconomic backgrounds in the press statement. As of 2012, one-fifth of all college students benefit from Odyssey scholarships, which reduce or eliminate loans for students with annual household incomes of less than $90,000. Similarly, 18 percent of UChicago students receive Pell Grants, situating the University in eighth place in terms of economic diversity at the nation’s top 25 colleges, according to U.S. News & World Report. Michael Borde, an admitted student from the Chicago area, is a recipient of an Odyssey scholarship. However, he explained, that further negotiation of his financial aid package was still on the horizon. “My mom is negotiating for a higher package. I’m not sure how it will impact my decision,” Borde said. Boyer believes that this trend of the ever-decreasing admissions rate is unsustainable in the years ahead. “I doubt we’re going to see these kinds of surges year after year. I think that’s probably not realistic. I think where it will level off I can’t predict—we may go up or down in terms of applications next year, and then level off. I suppose you could say we should be able to get as many applicants as the Ivies, but I think we’ve already surpassed a number of the Ivies in application numbers,” he said. Four Ivy League schools—Cornell with 40,006 applicants, Harvard with 35,022, Columbia with 33,460, and UPenn with 31,219—surpassed the College in terms of applicants. However, Brown, Dartmouth, Yale, and Princeton all received fewer applications than UChicago. For Boyer, numbers aren’t the whole story.